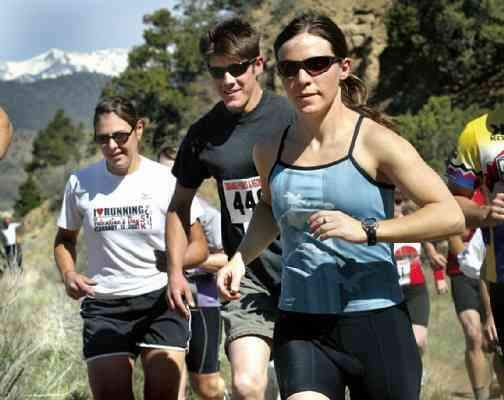 Runners take off in the trail- run portion of the annual 2008 South Rim Duathlon in Durango in this file photo. The popular, Durango-style duathlon returns next weekend with a trial run and a mountain-bike ride.The seventh annual South Rim Duathlon will return at 10 a.m. on Sunday, May 3, under the sponsorship of Durango Parks and Recreation. The event starts at the Sale Barn trailhead, across from Home Depot. The duathlon features three different course lengths. The long course consists of a 6-mile run and an 18-mile bike ride. The short course includes a 2.5-mile run and a 6-mile bike ride. The kids' course includes an 800-meter run and a 1-mile bicycle ride. Children 12 and under can race for free. The preregistration deadline is noon May 2. Racers may register at the Durango Community Recreation Center. Race-day registration and packet pick-up takes place from 8:30 a.m. to 9:30 a.m. at the Sale Barn trailhead. Racers may register for the short course or the long course in the following divisions: male solo, female solo, male team, female team and mixed team. Cost is $25 for individual entrants, $60 for teams. For entry information, contact Heidi Schaiberger at 375-7306 or visit www.durangogov.org. Last year, perfect weather greeted the field for the South Rim Duathlon. More than 50 individuals participated along with eight teams last year. Dan Ourada was the overall winner in 2008. Tom Ober was second. Shonny Vanlandingham won the women's division last year. Kristin Danielson was second. "Race-day registration and packet pick-up takes place from 8:30 a.m. to 9:30 a.m. at the Sale Barn trailhead."